Probably the first thing that you will become aware of, if you weren't already, is that the ferry port will ask you if you have your red warning triangle, your fluorescent jacket and your headlight adjusters in place. If you haven't, you will be strongly advised to purchase these then and there. Don't ignore this advice, it is now a legal requirement in France and travelling without them could leave you with a 100 Euro fine. If you should suffer a breakdown on the roads and you do not have this equipment on board, you will be committing an offence as well as putting yourself and other road users in danger. And as from 1st November 2012, you must also now carry with you two officially approved breathalysers. It is also quite common for the gendarmes or the police to conduct spot checks, asking to see this equipment. Many people in France put the yellow jackets on the back of the driver's and passengers' seats so that they are clearly visible, which does seem to lessen the frequency of these spot checks! Regarding the headlights, all that is required if you are just on a short visit to France is that you place the stickers (available to buy at ferry ports as well as specialist car shops) on your headlights to direct the beam towards the side of the road instead of blinding oncoming traffic. If you plan to live in France (Life in France), however, you will need to make a more permanent change if you intend to keep your British car for use here. One more thing you may have to purchase at the port is a GB sticker. You need to display this only if you do not have the new style Euro plate which incorporates the circle of stars along with the national identity. It sounds a little silly to have to say it, as I am sure everybody is aware that in France you must drive on the right hand side of the road instead of the left as in Britain. It must be said, however, because every year there are needless accidents caused by British visitors forgetting this very simple rule. In fact, it isn't so much on the main roads that the problems occur, rather on smaller, narrow roads where instinct tells you to move to the left to avoid an oncoming vehicle, or after making a turn or a stop. Setting off again after a short break is a common time for old habits to die hard and for drivers to make for the left hand carriageway, so be doubly aware at times like these. Roundabouts can seem a little strange at first, but you will soon get used to them and they rarely cause problems. Priority is to any traffic coming from your left... usually! 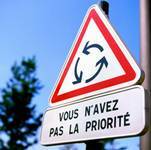 There are some roundabouts where this is not the case, however, although these are few and far between, where priority is given to any traffic joining the roundabout, therefore coming from the right! There is another very odd rule of the road in France, however, which is that there are certain places where traffic coming from what is apparently a minor road has priority over the traffic already on what appears to be the main road. This is exclusively when the minor road joins the main road from the right, and although it can be difficult to see, it is usually when there are certain clear markings on the road ushering the traffic from the right into the main road, or, less helpfully, when there are no lines, dotted or otherwise, across the end of the minor road. It is an antiquated law, this priority from the right, but although largely eradicated in the main towns, it still occurs when you least expect it, especially in small towns and country roads. The general rule of thumb is always be cautious when there is a road joining from the right! These are quite tough in France, and easier to fall foul of with just a glass or two of wine. The limit is lower than in the UK, set at just 0.5mg (50mg per 100ml) in comparison with the UK's 0.8 (80mg per 100ml). The gendarmes and police are getting wiser too. When we first moved to France, some five years ago, we used to see the gendarmes breathalysing people in the early evening, usually when they were on their way out rather than on the way home. Finding they didn't catch many that way they have now switched to late evenings (and mornings and early afternoon, after lunch), rather more lucrative ground from their point of view, although I have heard one or two grumble that they would rather be at home with a glass of wine themselves at that time of night! The police and gendarmes also run spot checks as well as stopping anyone they suspect of drinking, and there are serious consequences if you are caught over the limit. As little as one good glass of wine could well land you in a lot of trouble, even in prison, so don't risk it. Speed limits are being enforced more than ever before in France, as a response to the country's poor accident record. Speed cameras and hand held radar traps are commonplace, but the "consolation" is that the local paper publishes details of where and when these will be. The intention is, of course, to prevent people from speeding rather than so that they can avoid the traps. The dry weather limit for cars on the open roads is 90km, 110km on a dual carriageway, 50km in a town and frequently 30km in the centre of a village, although if this is the case there will be signs. Motorways are set at 130km, which is a realistic speed. Wet weather limits differ, coming down to 80km on the open roads, 100km on dual carriageways and 110km on motorways. Motorway driving is usually pretty good in France, where it is, thank heavens, an offence to hog the middle lane! France operates zero tolerance on speed limits, so it is a very good idea to take them seriously. Fines can be levied on the spot, but if you opt to pay by post you need to pay within a certain period of time or the fine rises sharply. (Although you may not be given the option as I have heard of people being taken to the bank to get the cash before being allowed to drive on!) Remember too, to carry all the usual documentation with you at all times. You should have your insurance details, photo driving licence and vehicle registration documents. One issue that is being hotly debated at the moment (October 2010), is the plan to introduce a European wide linked system which records driving offences and adds or deducts points to or from the licence of the offender, regardless of what country the offence has taken place in. It has been the case that you would usually not be penalised in terms of points for something like a speeding offence if it occurred in France when you were driving on a UK licence (although you would still be liable for the monetary fine). This change is currently only under discussion, but it seems likely to come into law in the near future. As in the UK, seat belts are compulsory for all drivers and passengers, front and back seats. Children under the age of ten must sit in the back seats. It is also compulsory to use the correct restraint systems for children according to their weight, with all children between 9 and 15kg having to use a child seat. Children larger than this need to use a booster cushion with the normal seat belts. Insurance is, of course, essential and compulsory to a minimum level of third party (Car insurance in France). Rates are generally reasonable, but it can be difficult to insure a British registered car in France (Taking a car to France and registering it in France), with the insurance laws tightening up on allowing agents to issue insurance certificates for foreign cars. The most helpful I have found are Frank Haloche and Claire Martinet, based in Ernee in the Mayenne department, (tel: 02 43 05 21 82, email: 4005417@agents.allianz.fr) , who speak excellent English and explain things clearly at all times. They are happy to operate at a distance, so it doesn't matter whereabouts in France you are based, everything can be done through email, telephone and post. However, even the most helpful firms have to ask you to change the registration to a French one, as soon as possible. It used to be that you could insure a British plated vehicle for up to a year, occasionally longer in certain circumstances, but now by law up to six months is allowed, with many agents now asking that the French registration is completed much sooner, within three months in certain cases. Your insurance ticket must be displayed in the front windscreen of the car. You should also ask for a "European Accident Statement" form so that should you be unlucky enough to be involved in an accident you can take all the details for your insurer in the proper manner. Another point about driving in France is the matter of the CT, Controle Technique, which is the French equivalent of the MOT. All cars over the age of four years must have, or be sold with, a CT certificate. This lasts for two years, after which it must undergo another test. If you are stopped by police or gendarmes and your car is found not to have a current CT, the car can be impounded immediately. If your car fails its CT, there is a two-month period during which you have to correct the faults and return to have the car retested. Note, it is obligatory, if you are selling a car of four years or older, to have the CT done before the sale. The only exception to this is if the last CT was done within six months of the sale. As many people who own property in France or spend any length of time here are based in the mountainous regions of the country, in or near ski resorts (Ski property, Ski Chalets for Sale in France), it is important to consider snow chains and winter tyres. Winter tyres are not compulsory, although they are a good idea, but snow chains may be a necessity on certain roads in snowy conditions. In fact, if you do not fit snow chains when conditions require them, the police may stop you and prevent you from continuing to drive. France has a high proportion of cyclists and motorcyclists on the roads, so be aware of these (Cycling and motorcycling in France). Cyclists are expected to be given great consideration, and should you have a collision with a cyclist you can expect to have to prove very clearly that the cyclist was at fault, or the accident will be deemed to be the fault of the car driver. Motorcycles and scooters are extremely popular in France too, with many riders being teenagers. Children can begin to ride 50 cc scooters on the roads from the age of just 14 (at 16 they can ride a more powerful bike and at 18 drive a car), and although they have passed a test to do so before being allowed on the roads, they are young and inexperienced and can occasionally do the unexpected, so exercise extreme caution around them! Driving in France can be very pleasurable! Do your homework, know the rules and stick to them and there is nothing else to do but enjoy. I am English and a UK resident. Many years ago I was resident in France and changed my UK driving licence for a French one. 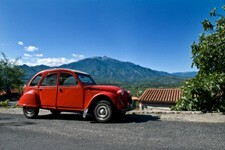 I have recently bought a holiday home in France and a French car. Can I legally use my French driving licence when I am in France and the rest of Europe? I do not drive in the UK and do not own a UK car. Thank you. and contact them should you not find what you are looking for. You could also try contacting the DVLA in the UK for their advice.